On the expansive, cheerful grounds of Bronner’s Christmas Wonderland in Frankenmuth, Michigan, sits a peaceful white chapel, with a domed roof, reminiscent of its Austrian roots. The small building is a 1:1 scale replica of the Silent Night Memorial Chapel in Oberndorf, Austria. 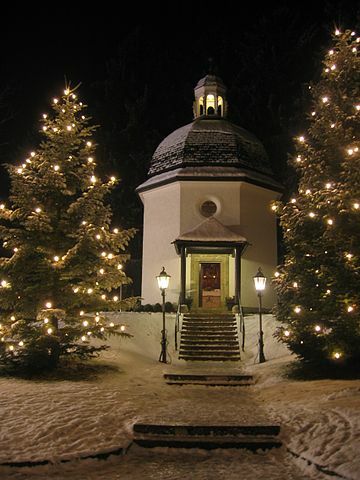 The Austrian chapel commemorates the spot where the much beloved Christmas song, “Silent Night” was first sung. The story has been told that the organ in the Tyrolean parish of St. Nicholas was broken. The assistant priest, Fr. Joseph Mohr, had written a poem which became the song’s lyrics. He asked his friend, the local schoolteacher and organist, Franz Xaver Gruber, to create a tune to go with his words. Gruber composed the music for “Silent Night” on Christmas Eve of 1818. Mohr played the guitar and the two men sang the song together that evening. Musicians carried the song with them through Europe and eventually to America. The beautiful song has been translated into many languages, possibly more than any other Christmas hymn. 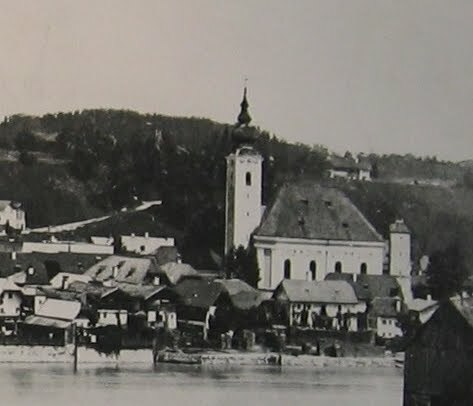 Due to damages from floodwaters, a new St. Nicholas church was built on higher ground in 1906. In 1937, the little Silent Night Chapel was erected and dedicated in commemoration of the origin of the favorite song. In 1976, Wally Bronner was on a buying trip for his Christmas Wonderland, when he visited the tranquil little Austrian chapel and decided building a replica would be a good way to show his thankfulness to God for the many blessings in his life. Wally had always desired to keep Christ in CHRISTmas with his store filled with Christmas decorations and nativity scenes. The sparkling, cheery environment at Bronner’s has been for many years a delight to the eyes and the heart. 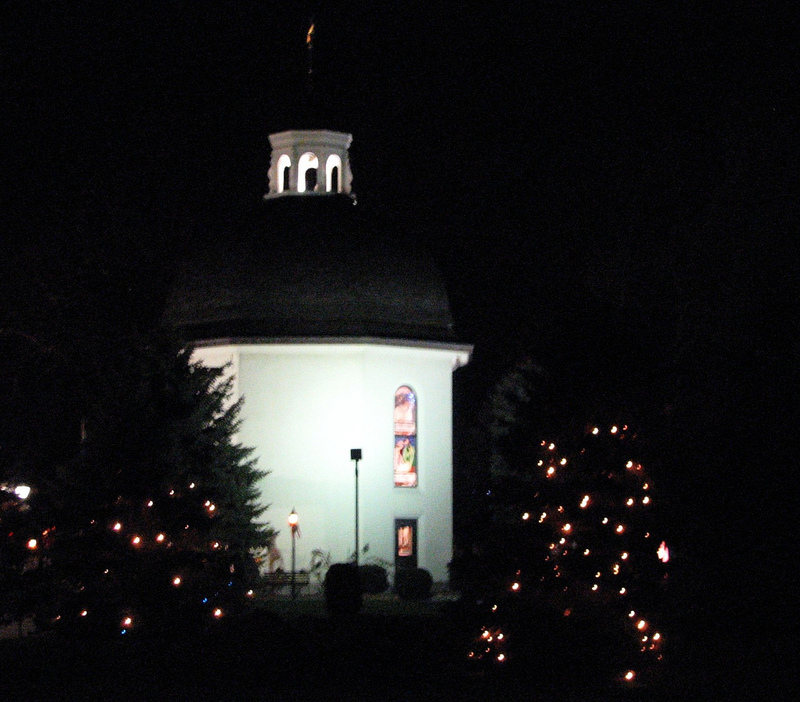 With permission from Oberndorf’s city officials, the Bronners built a replica of the octagonal white chapel. Construction began in 1992 and the dedication took place later that year. I can only describe visiting the Silent Night Chapel as a reverent experience. The diminutive place of worship inspires quiet meditation and prayer. Wally Bronner sought to honor God, but also has shared with visitors a piece of history, a place to remember the origins of our beloved Christmas hymn, “Silent Night.” And perhaps, for a minute, give people a touch of what it would have been like to experience the first time it was sung in that Austrian parish nearly 200 years ago. Merry Christmas! 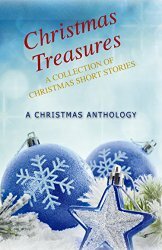 I'm giving away a copy of Christmas Treasures, an inspirational Christmas story anthology, to one lucky commenter! Her debut novel, Rumors and Promises, from Lighthouse Publishing of the Carolinas, is coming out in April, 2016. Christmas Treasures contains Kathleen’s short story, “Special Assignment,” with a touch of humor and the supernatural. Thank you for this interesting post! I hope to visit Frankenmuth someday. Silent Night is one of my favorite Christmas hymns. which captures the peace and reverence of that holy night for sure! Thanks for sharing this, Kathy. I'd never heard of the Silent Night Chapel before. It's a cool tribute to a wonderful song. You're welcome, Vickie. I'm so glad you enjoyed the post. Thank you for this post. It was very interesting. What a wonderful way to commemorate this wonderful hymn. Thank you for the chance to win a copy of this book. You're welcome, Susan. It was a cool story to research. Having been in the replica chapel, I wondered further what the story was behind the original. Hi Kim, thanks for stopping by. Merry Christmas to you as well! Thank you so much, Caryl! I hope your Christmas is filled with His presence as well. It is a beautiful touching song..
Merry Christmas to you, Deanna! We visited Bronner's wonderful store several years ago. I am sorry to say, we missed the Silent Night chapel! We will have to visit again one day. Thanks for sharing and Merry Christmas. Thank you for sharing your wonderful post. Merry Christmas and my wish for you is a healthy and happy 2016! Thank you, Melanie. The same to you! who participated and Merry Christmas! There is nothing more beautiful than hearing Silent Night in a candlelit church and nothing so peaceful as listening to it in my own home, with only my Christmas tree giving light. I would love to visit the chapel and I greatly appreciate this informative post. Merry Christmas!